1. Nick Foles, Philadelphia Eagles: Leading the Eagles to the playoffs as a first-year starter earned Foles, then 23, respect around the NFL. 2. Stephen Curry, Golden State Warriors: In his fourth year in the league, the 25-year-old set the NBA record for three-pointers made with 272. 3. Clayton Kershaw, Los Angeles Dodgers: Two National League Cy Young Awards made fans think of legendary Dodgers ace Sandy Koufax. Kershaw, 25, was humbled to be mentioned in the same sentence. 4. Andrew McCutchen, Pittsburgh Pirates: Winning the National League MVP would be enough, but McCutchen, 27, also helped the Pirates end a 21-year losing streak and playoff drought. 5. Chris Davis, Baltimore Orioles: Straightening out his swing helped the 27-year-old slugger lead Major League Baseball in home runs (53) and RBIs (138). 6. Maya Moore, Minnesota Lynx: After the 24-year-old led her team to a second WNBA title in three years, Minnesota fans are hoping this will be a common sight. 7. Russell Wilson, Seattle Seahawks: Two playoff appearances and two Pro Bowl selections in two years. Nothing else needs to be said about the 25-year-old. 8. Alfred Morris, Washington Redskins: After a breakout rookie season in 2012, the 25-year-old Morris’ consistency was one of the lone bright spots for a beleaguered franchise. 9. Derek Ernst, PGA golfer: The 23-year-old turned pro in 2012 and won his first PGA Tour event in 2013, the Wells Fargo Championship, in a playoff. 10. Kevin Streelman, PGA golfer: Though he turned pro in 2001 and won his first event in 2013, it was a breakout year for the 35-year-old. He also had five Top 10 and nine Top 25 finishes, and represented the U.S. in the World Cup. 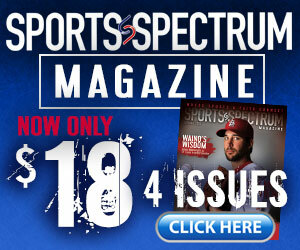 This story was published in the January 2013 DigiMag of Sports Spectrum.